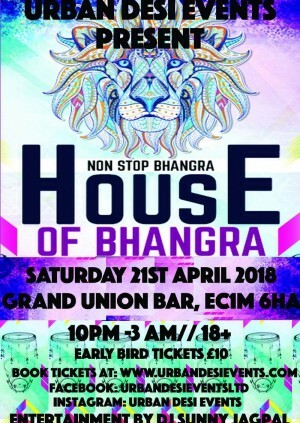 Join us on 21st April 2018 for London's Biggest House of Bhangra Night at Grand Union Farringdon. The event will take place in one of London's most notorious basement bars. Expect to be wowed by the stunning high ceiling, exposed brick walls and quirky, Victorian style decor. Neon signs and opulent curtained vaults complete the theme and provide a fitting backdrop for a decadent night out. Dance the night away to all your favourite Punjabi and Bollywood tracks provided by DJ Sunny Jagpal from 10pm to 3am. Please note all VIP Tables have a minimum bar spend; a bar tab will be set up for you upon arrival. Please note all tickets are non refundable or non transferrable. Please visit our Terms and Conditions for further details.